Hey guys! 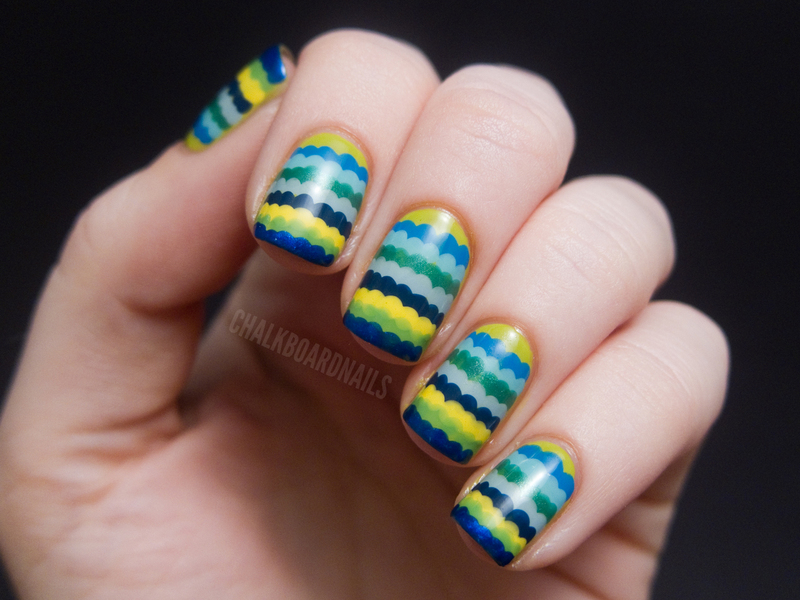 Today I have a tutorial for you that I wrote a really long time ago for a collaborative nail art guide that I was asked to be a part of. That kind of fell apart I think, so I'm posting it now! The tutorial is for the ruffle nails that you may have seen on here way back when. I called it the "Carmen Miranda" manicure back then. Maybe we should call this a Carmen Mirandicure? Today's version uses shades of blue and green for a bit of a different look. 1. Start by painting your nails a base color. 2. Select your first ruffle color, and using the large end of a dotting tool, add on a row of connected dots that goes all the way across the nail. 3. Select your second color. After you have cleaned your first color off of your dotting tool, add on another row of dots that overlaps slightly with the first row that you did. 4. Continue on in this fashion with the rest of your colors until your whole nail is filled up with fabulous ruffles that would make Carmen Miranda proud. 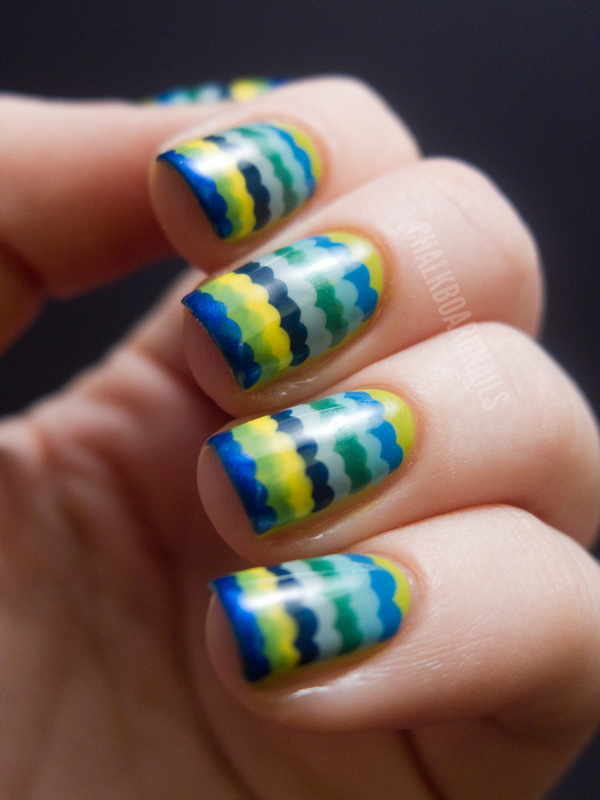 Your last color should go off the edges of your nails to cleanly finish the look. That’s it! You have now competed a fabulous and eye-catching ruffle manicure. Finish it with topcoat and go show it off to all of your friends! As always, I'd love to see if you give this manicure a try! 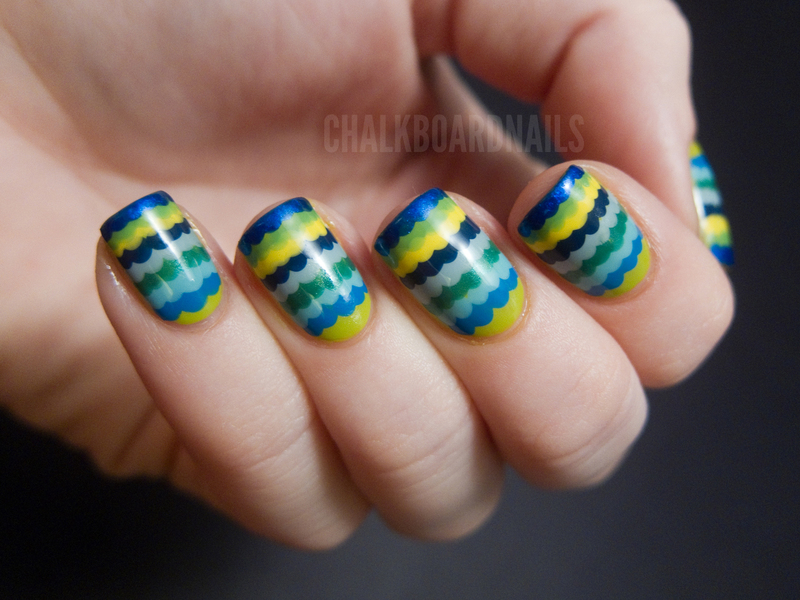 You can easily share with me by email or on the Chalkboard Nails Facebook. So cute! I definitely want to try it! awesome!! will try on my next mani for sure. Adorable! It seems pretty easy to accomplish, too!! Looks easy and simple! I will try it out soon! That's gorgeous!! I love it! This is super cute, great tutorial too. Great idea, I am going to try this soon! I'm in LOVE!! SOOO doing this!! Great tutorial! The dotting should be easier than the end product looks. Gotta try it! I love this... I'm going to do it soon! I love this! And, I feel like it is something I could actually do... time permitting! All those dots must take some time! pretty! i will try this!! I'll def be gettting a dotting tool after seeing this tutorial! MUST TRY!!!!! 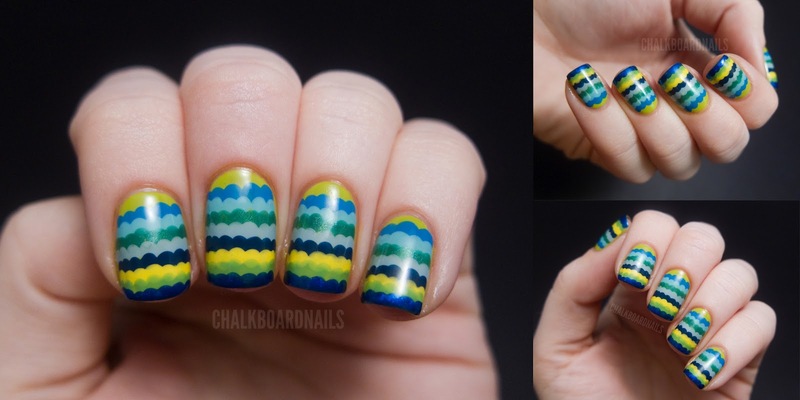 This is an awesome idea, I've never thought to use dotting tool like this!! I definitely have to try too...! Super cute! I'll have to try this! Will be trying this soon!!!! This is so freakin adorable! Can't wait to try this! 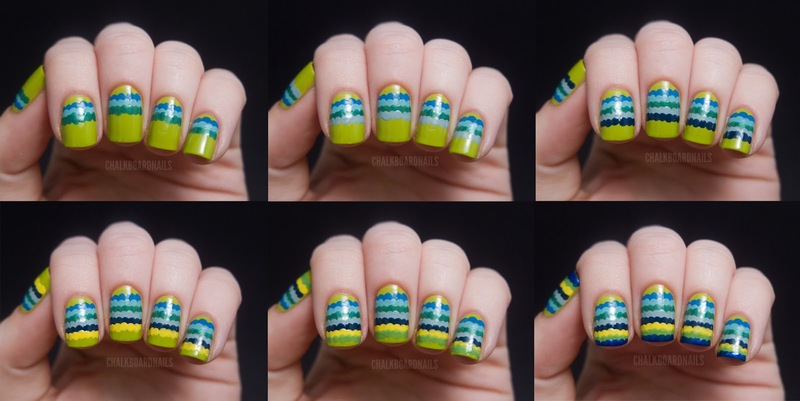 The tutorial is excellent, I have to try it too and the color combo is amazing! Wow, I love this! Must have taken forever! Thanks for the tutorial! It is super cute, but must have taken forever. I am going to have to give it a try. Wow what a cool look thanks to Captivating Claws for directing us here too. 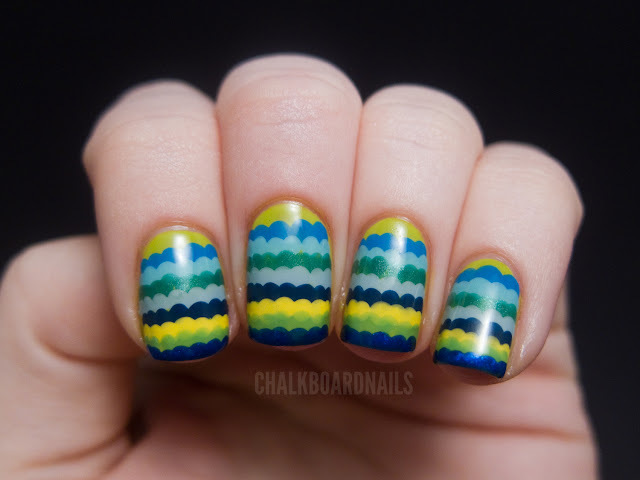 I can imaging doing this for Easter in pastels like a painted egg with rounded tips . Thanks love your tutorials. you must have lotsa patience! i have the 2 dotting tools, but have never taught of doing this before. so exciting! new things to do this wkend! I tried it too. 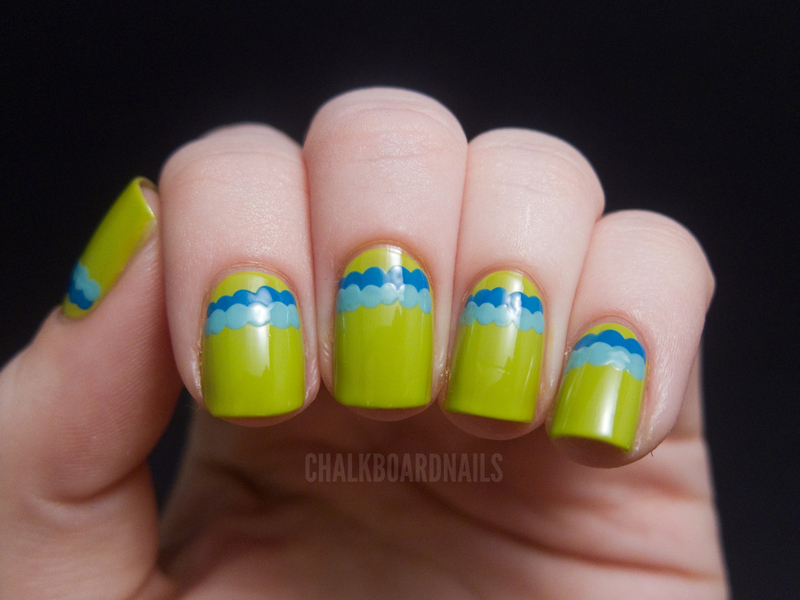 Fun to do and they look cute. ahhh I need to try this asap!! I love this!!!! Thanks for the cool tutorial! Thank you! And yes, I am unfortunately already aware of Jen's videos. I appreciate you taking the time to come and let me know.